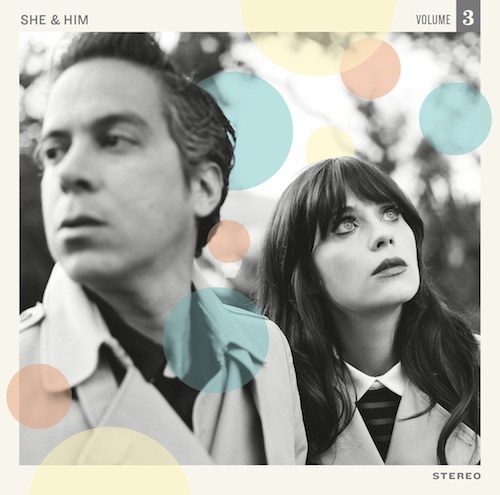 J’étais tellement contente quand j’ai appris que le duo She & Him sortait leur nouvel album Volume 3. Je pensais que l’attente serait trop longue à supporter. La sortie est prévue pour le 7 mai aux US et heureusement, She & Him nous fait patienter en nous offrant le premier single. « Never wanted your love » nous donne déjà une charmante idée de ce que sera le Volume 3. Fidèle aux albums Volume 1 et Volume 2, cette chanson fait déjà partie de ma playlist. J’adore la collaboration entre Zooey Deschanel et M. Ward, mais j’adorerais encore plus si la voix de M. Ward y était plus présente. She & Him a déjà prévu ses dates pour leur North American Summer Tour. Ils joueront au Summerstage Central Park le 6 juillet prochain (avec Camera Obscura). Quelqu’un a prévu d’y aller ? I was so happy when I heard the news that She & Him was releasing their new album Volume 3. I thought the wait would be too long to bear. The release is scheduled for May 7th in the US, and thankfully, She & Him kindly gave us a new single to listen to while waiting. “Never wanted your love” sets the bar high already by giving us an idea of what Volume 3 will sound like. Faithful to the songs of Volume 1 and Volume 2, this track is already a new addition to my playlist. As much as I love the collaboration between Zooey Deschanel and M. Ward, I would love to hear his beautiful voice more often on the tracks. She & Him has already planned the dates for their North American Summer Tour. They will be playing at Summerstage Central Park in New York on July 6th (with Camera Obscura). Is anyone planning to go?